Continued from the previous post . . . .
My own view is that it is a mistake even to speak of “gospel tradition” at this stage since such a concept is itself an untested assumption. What we have are gospels. Scholars generally assume they are products of authors compiling traditions. But I don’t know if this has been argued with reference to evidence by anyone — though I have seen many arguments for it that are based entirely upon the hypothesis (or cultural tradition) that the core narratives ultimately originated with the life of an historical Jesus. Keith points out that studies since the time of the classical form critics have shown that scholars may have overestimated the extent to which the Gospel authors reshaped the traditions they inherited. Further, the form-critical assumption that the Gospels can be dissected into various layers of traditions is now in serious doubt. Surely this fact (that Palestinian and Hellenistic Christianities are a false dichotomy) leaves us with less reason to assume that the Gospel authors were garnering and weaving “traditions” into narratives that so clearly appear to be creative imitations and adaptations of other literature. Historical Jesus scholars appear to be on the way to replacing one set of failed tools with a lot of postmodernist mumbo jumbo. At this point Keith writes on behalf of many historical Jesus scholars when delves into abstract complexities that appear to be necessary solely because there is no evidence for Jesus that is comparable to the sorts of evidence historians generally study. The idea of first analysing the documentary evidence to assess what questions can be asked of it (as is correctly done in other historical studies) remains far from scholarly consciousness here. The tradition shapes the question and the evidence must be made to answer it no matter what. We are told — as if it were a new concept for biblical scholars — that there is no such thing as memory without some element of interpretation. Of course. And historians in all other fields of inquiry have always understood this simple truism. It’s more commonly called “bias” in the sources. Cicero does not give us a purely objective and unmediated account of Julius Caesar. Historians must make allowance for his bias. The same is true of Caesar’s own account of his conquests in Gaul. Every account of every event or person must necessarily be from a particular point of view. There is no such thing as any perception or memory or account without it. The problem facing biblical scholars is that they have no evidence from the pre-Gospel “traditions” to study. It is unthinkable, for most of them, that none ever existed. Now they are essentially saying that any of those sources that did once exist were relayed through people who had biases or points of view in the way they recollected and passed on the stories. Well, that should simply go without saying. All Keith is saying is that scholars cannot retrieve any facts that were not in some way perceived or passed on with some sort of interpretation. They all had interpretation as their wrapper. Oh this basis he argues that there is no such thing as an “authentic” tradition in the sense of an unmediated and objective fact. But that’s the same with every source that does exist in other fields of history. It doesn’t mean that we can’t know if Caesar did or did not cross the Rubicon, or if such a detail is nothing more secure than “an earliest mnemonic refraction of a memory” — as Keith explains when discussing Le Donne’s thesis (see below). So finally Keith reaches the point where he says that scholars should stop trying to find “authentic” traditions in the sense of “uninterpreted” traditions. (Even Caesar’s wars are interpreted by their recorders but that doesn’t make them “inauthentic”.) This means they cannot use criteria of authenticity to find “authentic facts” about Jesus. The whole rationale of authenticity criteria fails. Result. They must start with the Gospels as they are and explain why they tell the stories they do in the way they do. He does acknowledge that some interpretations will have “better claims to historical accuracy than others, and it is the job of critical scholarship to assess those claims.” But finding or assessing those “facts” is one of the last things the Jesus historian does! So near yet so far! Definitely scholars of Christian origins should first and foremost seek to understand and explain the Gospels and their interpretations. But why go and prejudice that exercise by insisting that the answer must be found in earlier “oral traditions”? Chris Keith discusses three of the most recent efforts to rehabilitate the use of authenticity criteria in historical Jesus studies. What Wright was trying to emphasize was that any datum that could be validly interpreted as a link between Judaism and the Christianity of the Gospels — a kind of “missing link” — should be granted the status of quite possibly historical. Again with my own critique, Wright finds another way to alchemize straw data into golden “facts” by the mere pronouncement of a new “missing link” category. The new alchemy of Wright did contribute towards a supposedly “saner” (Keith) view of Jesus than the mere criterion of dissimilarity alone achieved. Jesus was now allowed to be a little bit like both Judaism and Christianity and not only completely unlike both, as Keith notes. But surely real history really did happen in some sense, yet the Jesus being manufactured here is hypothetical from start to finish. There is no anchor point in external controls. Once again we see a return to something that will create a bridge between Judaism and Christianity. Chris Keith thus sees Theissen and Winter as being similar to N. T. Wright in their preference to modify the criterion of dissimilarity with something that allows a bridge between Judaism and what we recognize as Christianity. But other scholars have concluded that Theissen and Winter have in effect revised or slightly modified the criteria already well established. Their “coherence of sources”, for example, is only another name for “multiple attestation”. The term “memory refraction” is used to remind us that all memory involves interpretation. Interpretation of what Jesus said and did did not begin with the Gospel authors. The aim is not to dig for an unrefracted memory; the historian’s aim is to account for the earliest mnemonic refractions of a memory story. As long as it is kept in mind that the historical goal is not to verify what ‘actually happened,’ I am comfortable with these terms. My own view is that when a “historian” says his task is not to establish or verify “what really happened” then he is confessing he has no history to work with at all. Though the processes and mechanisms are open to study, it is nonetheless a simple truism that all memory involves interpretation and personal perception. (Apologists have been telling us that ever since they have been rationalizing the four contradictory gospel narratives as if they are four different memories of the resurrection of Jesus.) But this does not change the fact that historians do know “what really happened” — that Caesar really did cross the Rubicon, that Anthony really was defeated at Actium, that the Bastille really was stormed on 14th July 1789, that the priest who entered the details on the birth register did indeed correctly remember the names that he heard. We are not even dealing with oral history because we have no interviewees to speak (nor transcripts of their words) except in our hypothetical reconstructions. Introducing “memory theory” has no justification in the evidence itself. Its only justification is that it can help scholars extend the hypothetical tentacles of their untested assumptions that the gospel narratives have some historicity lurking there somewhere. What Le Donne and Chris Keith and are perpetuating are the assumptions of untested Church tradition that the narrative is “a true story” at some level “corrected for refractions” — not unlike the way many have believed that Abraham and Moses and David are “sort of true stories if corrected for multiple refractions”. The difference, however, is that Le Donne would re-name such “a true story” or what “bedrock events” as “earliest mnemonic refractions of memories”. So it is no longer a historical fact that Jesus was baptized by John, but Jesus’ baptism by John is the earliest mnemonic refraction of a memory? Why not roll with the literary evidence and simply say the narrative of Jesus’ baptism was crafted in a manner comparable to aggadah midrash or if that is a taboo word then literary borrowing and theological creativity? This would involve adhering to one of the most basic fundamentals of historical research: first analyse the nature of the source documents – don’t make a priori assumptions about what sorts of information documents are capable of yielding. Scholars would then be embarking upon a genuinely historical investigation. They will frame their questions according to what their sources can answer instead of making unsupportable assumptions about their sources in order to ask the questions they would like to ask. Le Donne’s use of criteria of authenticity takes a supporting role in contrast to the way criteria were previously used to “confidently reconstruct the past”. 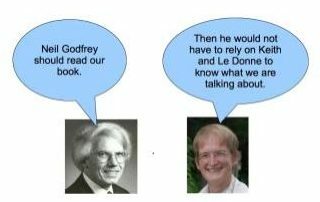 I discussed in a previous post Le Donne’s use of memory theory and triangulation. But since authenticity criteria were designed to remove the Jesus traditions or ‘real history’ from the “refractions” of early Church interpretations, Keith reasons (along with a number of reviewers) that Le Donne really ought to have no use for them at all. Keith concludes, then, that the criteria approach must be abandoned. We cannot justify attempting to pull apart the gospels to find some pre-gospel traditions as if they are the gateways to reality while the Gospels themselves are not. Scholars must instead attempt to account for the Gospel narratives themselves. Why did they come to be written that way, what were the refracted memories that led to their productions? The historical Jesus must be found by means other than criteria. Still the question of Christian origins is considered synonymous with the quest for the historical Jesus. Just maybe the evidence is pointing, rather, to the Gospel Jesus being a creation of Christianity in more senses than most New Testament scholars have realized. Posted on 2012-09-28 19:18:38 GMT+0000 by Neil Godfrey. This entry was posted in Biblical Studies, Historical Methods and tagged Biblical Criticism, Criteriology, Historical Method, Keith/Le Donne: Jesus Criteria and the Demise of Authenticity. Bookmark the permalink. If we assume there was no historical Jesus, and that it is all invention, do you think the sifting and sieving techniques of form criticism could still be useful for tracing the literary origins of the narratives? No. The criteria are in themselves logically flawed. 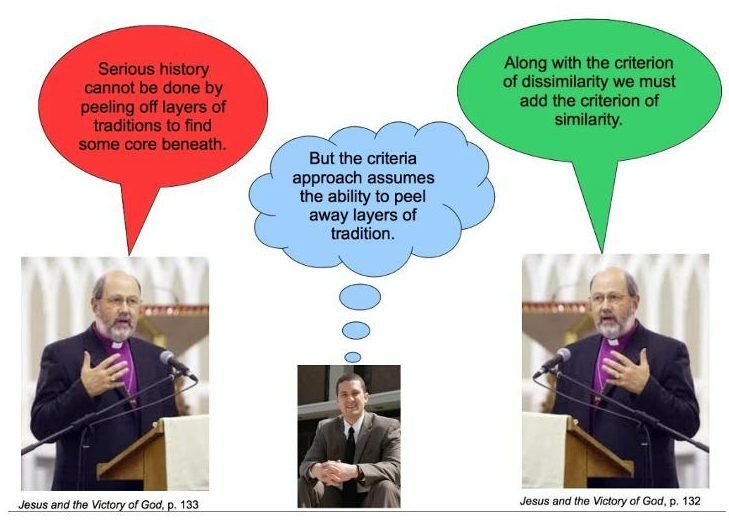 The assumption that the gospels can be distilled into various layers (in the sense understood by form-critics who believed earlier traditions could be so identified) is flawed. I have not read nearly as much as I wish but I do not recall encountering an argument justifying the assumption that the gospel authors were primarily compilers and weavers of traditions. The sources of the gospel narratives and characters are, I think, staring us in the face. Literary analysts have already pointed to them. But since most such analysts are also believe in the historicity of Jesus as the only conceivable explanation for Christianity they seem not to have put two and two together. How about employing Form Criticism … without the Criteria? For example, when we and others like Thom Thompson or others, note that many parts of the Bible seem formally similar to say, early coronation ceremonies? Here we note a literary or social convention or form that could have influenced the Bible. But we note this without directly using any of the Criteria. Form Criticism in the past has often been tied in part to the Criteria; but there have always been elements of it that are separable. What you are describing here is a more generic comparative literary analysis — it is identifying influences of other literature. This is quite different from form criticism in that it is not thinking to separate earlier from later strata. An author draws upon many influences and motifs from a wide spectrum. Thanks for the errata: first one has been corrected; second one, no, ‘overestimated’ is correct. Yes I completely agree that the sources of the characters and narratives are staring us in the face – and nothing to do with any historical events. The immediate sources of the parables and teaching are less obvious though most of such have widespread parallels in the writings over most of the ancient Near East and Easterm Mediteranean. It can all be reduced to the biggest and most naive assumption of them all — that no one would have invented a story about a crucified savior. With that assumption fixed as a dogma, there is no end to the smaller assumptions that have to be made to support and supposedly “explain” it.